When I think "What is my positive impact on the world? ", I realize that Microsoft is this giant lever that you can do something that immediately affects a huge swath of the world. That really floats my boat. The shopping season is in full swing, which means some of us might end up being victims of the Diderot effect. Let’s see if this sounds familiar. Suppose you remodel your kitchen; you’re not going to want to hang your ratty old pots on the new rack, so you go out and buy a whole new set of cookware. Or if you get a new suit, you might feel compelled to get some new shoes to go with it. Did you just get a new cellphone? It would not be surprising if you also decided to get a fancy new case, and a new set of headphones, and a new charger, even if your old one would work fine. One expense leads to another. This kind of upgrade treadmill, so to speak, is named for the French philosopher Diderot, author of (among other things) the great Encyclopédie. 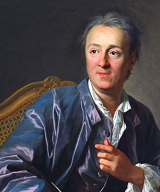 Diderot was impecunious most of his career, but later in life came into some money. As he described in an essay, he bought himself a new dressing gown, but then became unsatisfied with his other stuff. So he bought a new chair and new desk to match the opulence of his new gown, and then upgraded his possessions in other ways until he’d spent way too much money. The term Diderot effect was invented in 1988 by an anthropologist named Grant McCracken. The concept described by the name isn’t just about wanting to buy new stuff. More fundamentally, it describes how we create our identity through our things, and we want our things to have a kind of cohesiveness (i.e., we want them to complement one another). This is why, for example, we don’t hang our old pots in our expensive new kitchen; those things don’t complement one another. The phenomenon of Diderot effect also observes that we might pursue this until we fall into a spiral of destructive behavior—as Diderot himself did—by, in effect, trying to keep up with the image we have of ourselves. On to origins. Not long ago I learned a surprising etymology from Tom Freeman on Twitter. If you had to guess about where the word penguin comes from, what would you speculate? I mean, obviously it’s a borrowing from Old Antarctican, right? Or would be if there were such a language, or if people lived in Antarctica to speak it. But no, it’s actually from … ready? Welsh. At least, that’s a popular theory. The purported origin is pen, meaning “head,” and gwyn, meaning “white.” (The word pen as “head” also appears in place names like Penzance; we see the gwyn part in names like Gwenyth and Gwendolyn.) But you might wonder why a bird found pretty much only in Antarctica would have been named by the Welsh. Also, do penguins even have white heads? And while you’re contemplating words that we got from Welsh, consider corgi, the dog, which comes from Welsh words meaning “dwarf dog.” At least that derivation is pretty clear.